Let’s face it for some people a morning routine is very difficult. Allowing yourself 30 to 45 minutes each morning to practice yoga and morning meditation is a great way to get you headed in the right direction. For many people, mornings include making breakfast and getting the kids off to school. It can be a hectic part of the day. Taking some time for yourself each morning to calm the mind can have great rewards throughout the day. Each morning after I have had a cup of tea. I like to do a combination of yoga and morning meditation. By doing this simple routine each morning it will calm your mind and get you ready for the day. Find a quiet spot and lay out your yoga mat. I like to start with some simple stretching exercises. Starting with my legs and then working to my back. Then I incorporate some more advanced moves once I am loosened up. I find that these two videos will help you get started with a morning routine. Yoga with Adriene has a great morning routine to start your day right. I like to do a combination of both of these videos. The fun part about yoga is you can make up your own routine from poses that you enjoy and find helpful. Just take your time and enjoy the process. Try not to think too much just focus on how your body is feeling. If you are looking for more helpful yoga videos try watch inspiring yoga videos on Gaiam TV . They have a nice selection of helpful yoga videos with great instructors. 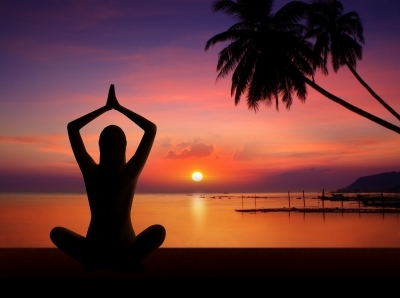 Once you are nice and relaxed from yoga it is time to meditate. I like to use a meditation timer on my phone. You can put in how long you want to meditate for and it will ring a bell when your time is up. It’s available here for the iPhone. I set my timer for about 15 to 20 minutes. Now use your yoga mat to sit cross-legged with your hands in your lap or wrists over your knees. Do whatever feels most comfortable. If you are a beginner at meditation you can check out our post on how do you meditate. Close your eyes and take a few deep breaths. Continue to breathe in and out of your nose at a normal pace. Try to focus on your in breath and out breath. If your mind starts to wander just gently bring it back to your breath. Don’t let your thoughts take you over. Notice how your body feels. Try and become aware of your whole body. Maintain this state until your timer bell rings. Once your timer goes off gently open your eyes and look around the room. Just become aware of your surroundings. You may notice objects and sounds that you never really paid much attention to before. Some things you may look at in a new way. Just slowly get up and try and take this feeling with you throughout your day. Making morning meditation and yoga a part of your daily routine came have some profound benefits. You owe it to yourself to spend a few minutes each day to check in with your mind and body. Starting your day out right can make your day much more productive and enjoyable. The more you do it, the easier it becomes. Try incorporating a morning meditation and yoga routine today!